The course at Galgorm Castle Golf Club lies within a spacious 220-acre estate that was once the ancestral home of the McQuillan clan and the Castle that looms over the 10th green dates back to 1618, when it was commissioned by Sir Faithful Fortescue. 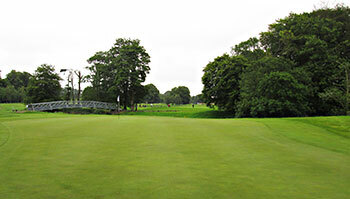 The lush fairways of the course are laid out in mature parkland, bordered on two sides by the rivers Main and Braid, with several small lakes adding further aquatic interest. Because of the low-lying aspect of the site, four of the fairways were actually raised during construction to cope with potential flooding problems in the future. The short par four 4th is a hole to be reckoned with on the front nine (even though it only ranks as stroke index 10 on the card) as the fast flowing waters of the Braid River race past the front of the green. “Treasury,” the 141-yard 7th is another hole where water must be crossed between tee and putting surface. On the inward half, locals will tell you the only way to play the 177-yard 14th, named “Devil’s Elbow,” is to “aim at the Slemish Mountains on the horizon – and be sure to take plenty of club,” otherwise your golf ball will probably end up wet on the river bed. I’m more than a little surprised to be the first person to review the Galgorm Castle course on the Top 100 site, having played it today in the pro-am for the Northern Ireland Open. I really would have thought a resident in this part of the world would have been keen to tell others about its many virtues before now. The course is set in a stunning location, where fairways are routed around a beautiful old estate, and its’s evident right from the outset that this place was constructed with tournament play in mind. Many of the holes dogleg either right or left on a pretty flat landscape and if you’re off the short cut grass and into the rough then you’ll probably drop a shot because it’s so thick. A great deal of the golfing interest here is found in the green contours, whether it’s a severely sloping putting surface like the 1st or a two tiered affair like the 12th so make sure your putter is in good working order. The two rivers play a large part in proceedings between the 4th and 15th, with around half the holes threatened by water hazards. thought the four tightly bunkered par threes were excellent, varying in length from 138 yards to 198 yards from the regular tees. As you might expect the day before a national professional championship, the course was in immaculate condition though it played a little long in the damp underfoot conditions today. The greens must have stimped at well over ten, which was easy enough to handle for professional Jack Senior in our group, but his three amateur playing partners found it rather hard to cope with, I must admit. I believe the course only opened in 1997 so it’s a modern track that will appeal to those who like their parkland golf to be both scenic and challenging. he pros will make it look easy over the weekend, of course, but you should treat it with the utmost respect if you play here as it will pose a stiff golfing examination.